Do you have what it takes to stay away from food and water from sunrise until sunset? 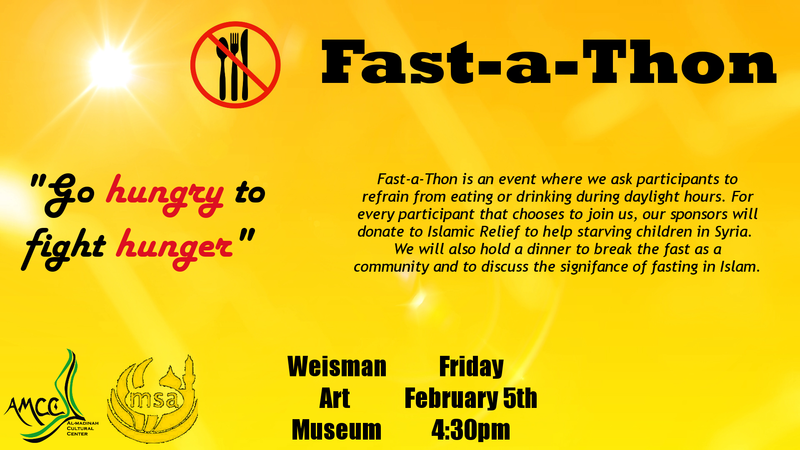 Join AMCC this Friday for our event, Fast-a-Thon! For each person who pledges to fast, we will donate $2 to Islamic Relief to help starving children. If you come to our dinner event where we all break our fast together, starting at 4:30pm in Weisman Art Museum, an additional $3 per person will be donated. Fast-a-Thon is a collaborative effort between Al-Madinah Cultural Center and the Muslim Students Association. It is a yearly event where we bring attention to the Islamic pillar of fasting, how it ties into religion, and the similarities/differences of the cultural role it plays all over the world. IF YOU WISH TO PLEDGE TO FAST FOR THIS EVENT, PLEASE FILL OUT THE FORM AT: http://goo.gl/forms/8Kl77vYuRV. For more information, visit our page at: Fast-a-Thon. Next Ski Trip this Friday!